When you are surrounded by the hustle and bustle of London, in a busy London fashion PR agency it’s completely necessary to take a step away from the concrete jungle and into the blissful surroundings of… a beauty spa. Recently, I journeyed to my spa of choice, the Y Spa at Wyboston Lakes, Bedfordshire, and prepared to unwind. Y Spa is located in the 400-bedroom hotel amidst a 350 acre leisure destination. The spa is set out to offer different relaxing ‘zones’ creating an atmosphere of complete relaxation understandably, I couldn’t wait to start exploring. To kick-start my spa journey, I ventured to the sleep zone, which features three different spaces to allow varying levels of relaxation. In the ‘Time Out’ area the black, shiny pods are ideal to curl up in for a snooze or read from the vast selection of magazines in front of a soothing coal fire. Hidden behind a wall of curtains is a row of waterbeds, all kitted out with beautifully soft, enticing blankets and pillows that envelope your body. If this level of relaxation isn’t enough for you, there is a ‘Big Sleep’ zone; a dark room full of beds and relaxing dream away music. I then headed to the outside hydro pool which is heated to the perfect temperature of around 35°C and is connected to the interior via a water-filled glass tunnel. 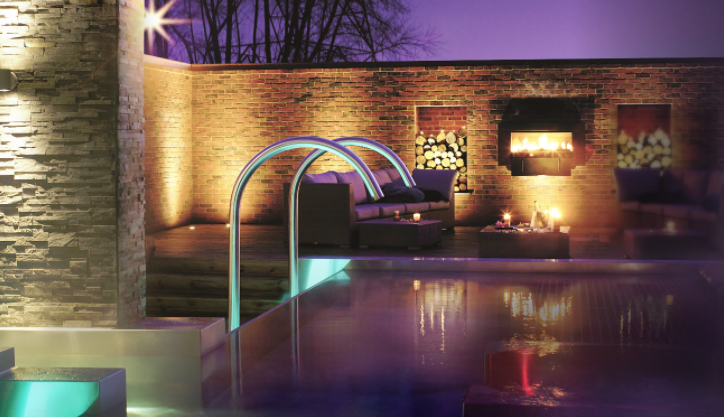 Also outside, there are comfortable seating areas and one of the beauty spa’s signature installations; the UK’s first authentic Finnish Kelo sauna which has been named ‘Some Like It Hot’! I chose the ‘Y Beauty Spa Fresh Face Facial’, which left my skin feeling incredibly soft and glowing. They used Elemis products throughout the facial and, at the end, gave me a product prescription handpicked for my skin type. The products were really gentle with a light texture and a lovely fresh scent. Afterwards, I sat myself in the manicure station to have the ‘Indulgent Hands’ manicure, including an exfoliation and massage, cuticle taming finished off with a shape and polish. My time at Y Spa, quite frankly, wasn’t long enough. I could have stayed there for another day and continued my self-indulgence, yet the London fashion PR scene was beckoning me. If you’re looking for a spa experience that will emotionally revive you, take you to dreamy places and allow you to totally immerse yourself in pleasure, this is the place for you. Quirky touches create a sense of fun; for example bouquets of flowers are left outside treatment rooms to signify they are occupied, the staff are friendly and welcoming, and the facilities are second to none. Treatments are reasonably priced and they offer a great range of packages that will appeal to any type of beauty spa go-er. Feeling relaxed and rejuvenated with a fresh complexion and gorgeous nails, I skipped back to London ready to embrace the week ahead.